Established in 2003, the factory employs 150 plus people in the city of Guangzhou. They are experts in their field, and the operation runs like an oiled machine. The premises is clean and organized, and the employees seem happy and relaxed in their work environment, and they like listening to music as they work. When we decided to create handbags, we knew we had to work with factories that are able to produce good quality products, better yet, used by top brands. Luckily, we had a friend named Mr.shi who is in the industry and willing to make an introduction. We went to visit the factory with Mr.shi and he introduced ‘CAIS ‘ as a ’small’ designer brand that might have smaller units compared to massively produced brand. This factory took a chance on us for our first production run. Mr. Xu is an great example of what we called "new generation Chinese factory owners". At Young age, Mr. Xu began his career as a pattern maker in leather handbag factories. 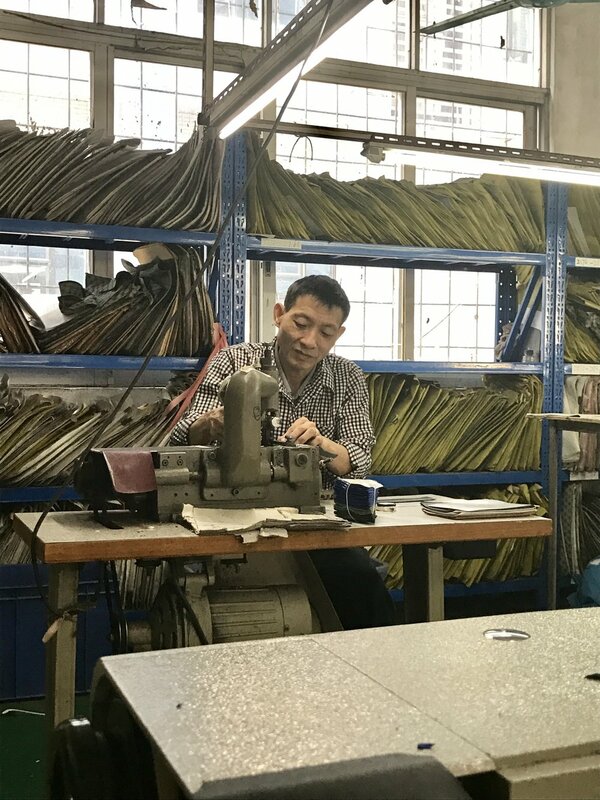 Over the years, not only he learnt the technical side of making great bags, combined with his knowledge and practice, he has also developed a great leadership skill. opened up his first factory in 2003, yet leading a team of 300 plus workers. Mr.Xu is very hands on throughout the whole process- from sample development to final production, he believes a good product can speak for itself. Those days where people only make cheap, unreliable products are coming to an end. Craftman-ship and innovation are the future of Chinese manufactories.